Italian illuminator, painter and woodcut designer, originally Liberale di Jacopo dalla Biava. His father, the baker Jacopo, came from Monza; his mother, Jacoba, was the daughter of the Veronese painter Zeno Solimani (active c. 1438) and sister of the painter Nicolo Solimani (active c. 1462-1493). The latter, according to Vasari, was Liberale s teacher (but mistakenly called Vincenzo di Stefano in the Vite). Liberale is documented in Verona in 1455 and 1465, but works from this period are not known. 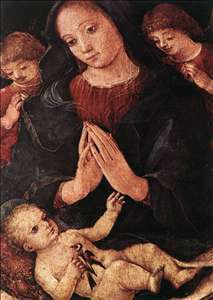 His career thereafter may be divided into two periods: as a young artist he was based in Siena, where his work on a group of choir-books for the cathedral demonstrates his originality as an illuminator; in or soon after 1476 he returned to Verona, where he established himself as one of the city s major painters. During both periods he travelled and worked in other centres. 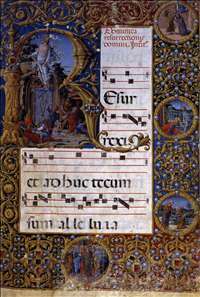 See more details about "Page of a choirbook"
See more details about "Madonna del Cardellino"